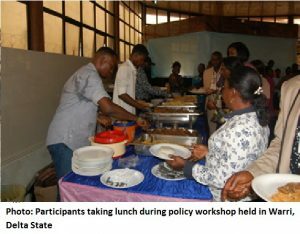 The policy workshop which was held in Warri, Delta State, September 26, 2017 was among several policy engagement meetings held with key stakeholders in Delta state as part of the concluding activities marking the implementation of an action research project on ‘Improving Maternal, Newborn and Child Health Care in Underserved Rural Areas of Nigeria through Implementation Research’ undertaken in Okpe Local Government area of Delta State, with support from four partner organisations-Think Tank Initiative (TTI) arm of International Development Research Centre (IDRC), Centre for Population and Environmental Development (CPED), Intervention Council for Women in Africa (ICWA) and Delta State Government through the Ministry of Health (DMoH). The Commissioner for Health Delta State Ministry of Health (DMoH), Permanent Secretaries (DMoH), key policy/decision makers in all the 25 local government areas of Delta state including coordinators of Primary Health Care departments, policy makers from the Delta state house of assembly, and directors of key government parastatal were all invited to the policy workshop. Other attendees were community leaders including women leaders from the project location, youths and opinion leaders from the various participatory project communities and the project team members. The focus of the policy meeting was to engaged these policy actors and opinion leaders, who usually decide on policies in the state, local and at community levels and implementing them, with key findings of the research on the challenges of accessing maternal, Newborn and Child Healthcare (MNCH) services in the state, and more especially to showcase what works best (innovative approach) in improving maternal and child healthcare service delivery especially in rural community settings through implementation research. The occasion was chaired by the Delta State Permanent Secretary (PS), MoH, represented by Dr. Philomena Okeowo who in her remarks commended the project team for the laudable project, re-echoed the commitment of Delta state government through the state ministry of health in ensuring the wellbeing of Delta people. The PS DMoH, stated that the outcome of the collaborative project is evidence based since the ministry was a partner in the implementation of the project right from inception and would do all it can to implement the recommendations as documented in the project reports and briefs. The PS also stated that the ministry has commenced interaction with the Delta state government on this innovative approach to improving MNCH service delivery with special reference to health care financing for mothers and children at all levels in the state. Also in his remark, the Chairman Local Government Service Commission represented by Mrs. Clementina Oyem thanked the CPED project team for the initiative and for focusing at rural communities instead of implementing such project in urban areas as some have the custom. 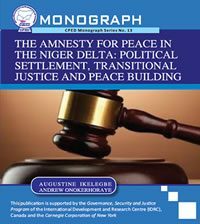 The chairman, however, appealed to TTI and its partners for more support in other to cover more communities in Delta state and beyond. According to her “more deaths occur in rural communities that are not reported and if these are actually taken into consideration, the figures for maternal and child mortality rates would double the current status. Efforts are needed by all stakeholders even the community members themselves to reduce these unfortunate occurrence” she added. The occasion also witnessed a panel session chaired by Job Imharobere Eronmhonsele, a member of the project team and head of communication division of CPED. During the three man panel discussion, experts were invited to make a short presentation on the (1) role of community leaders in improving maternal and child health care service delivery (2) role of the private health care sector in improving maternal and child health care service delivery and (3) role of policy makers in improving maternal and child health care service delivery. 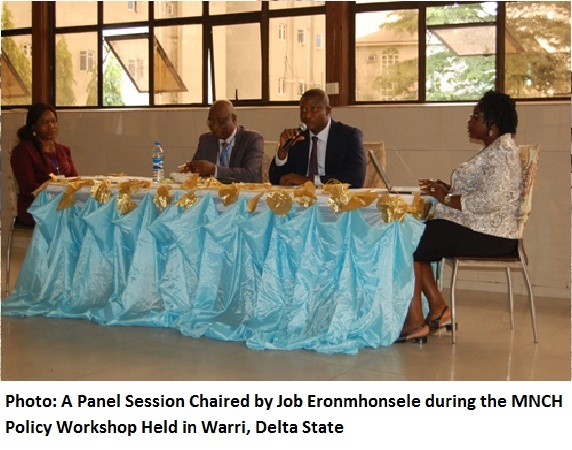 Thereafter participants had opportunity to asked questions which the panelists responded to. 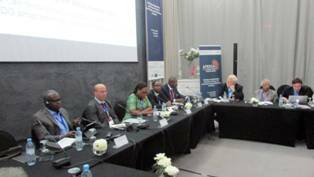 The panel session also provided opportunity for interrogation among key stakeholders in healthcare and health system strengthening. Dr. N. Orofuke, a member of the panel who focused on the role of community members in improving MNCH services at community level addressed issues bordering on cultural practices that are harmful and inimical to improved health care services. Dr. Orofuke stated that family and community involvement in healthcare and health-related decision is important for maternal and newborn survival. She further charged community members on effective preventive interventions that can be delivered through hygiene promotion, use of skilled birth attendants and avoiding delays in recognition of illness. Dr. Joseph Eregare, a private medical practitioner, who made presentation on the role of private sector in improving maternal and child healthcare service delivery, reiterate the fact that private providers can provide enormous data to feed into the national health information systems. The private providers can also help in building the capacity of auxiliary nurses and lay community health workers to cater for the shortage in health care personnel in PHC facilities across the state. He however advocated for government support to private healthcare sector to be able to play these key roles. Dr. Mrs Okeowo who spoke on the role of policy/decision makers in improving maternal and child health care service delivery emphasized that policy makers have the duty to lobby the apex government to implement the 15% budgetary allocation to the health sector (in order to meet the Abuja declaration target), especially for services targeted at the poor and vulnerable groups. Dr. Okoewo also stressed that maternal and child healthcare service delivery can be improved if policy/decision maker strengthen their monitoring and evaluation mechanism to ensure that funds disbursed are well utilised. 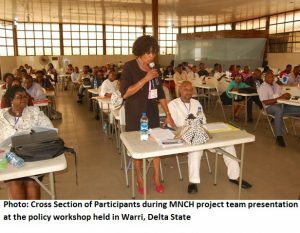 The MNCH project Principal Investigator (PI) professor Mrs. Felicia Okoro through a power point presentation showcased some innovative approached the project team has adopted in the delivery of MNCH services during the project period. She emphasized that engaging the community groups through direct participation in each phase of the project was a key strategy for its successful implementation. 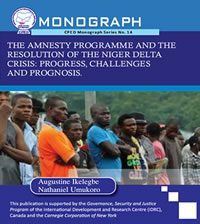 This engagement entailed capacity building and community dialogues with different interest group in the various participating communities. According to her, the various community dialogue provided opportunity for community members to understand their roles in order to take ownership of the project for its sustainability. Professor Okoro also stressed the need to revitalize the activities of the Ward Development Committee (WDC) in all the local government of the state. According to the PI, the MNCH project in Okpe LGA has demonstrated that when WDC are well constituted (selection devoid of personal interest), they are able to play key roles in improving MNCH service delivery as well as other PHC services in each ward. 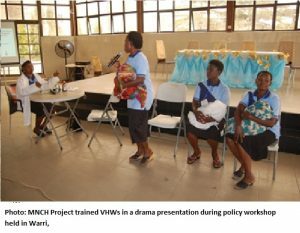 The PI during her presentation also recommended the training and use of volunteer village health workers (VHWs) in underserved rural communities for improved MNCH service uptake. She noted that preventable or treatable infectious diseases such as malaria, diarrhoea and pneumonia were the commonest illnesses in the project areas. And these account for over 70 per cent of the high child mortality ratio in Nigeria. She asserted that building the capacity of volunteer village health workers who in turn work with community members and the PHC facility staff in their day to day activities has worked well in promoting and improving MNCH service delivery in rural communities since the PHC facilities are characterized by lack of man power or health personnel. In his concluding remarks, the MNCH project team leader, Professor Emeritus Andrew Godwin Onokerhoraye commended the efforts and commitments of the participating communities and stressed the need for ownership of the key interventions of the project such as the establishment of the Community Health Insurance Scheme (CHIS). He further mentioned that CPED and its team will continue to draw the attention of government to the key health challenges people face in rural communities and enjoined everyone to work together so that what is being enjoyed in the project communities through the TTI supported implementation research project is replicated in other parts of the states and the entire nation at large. 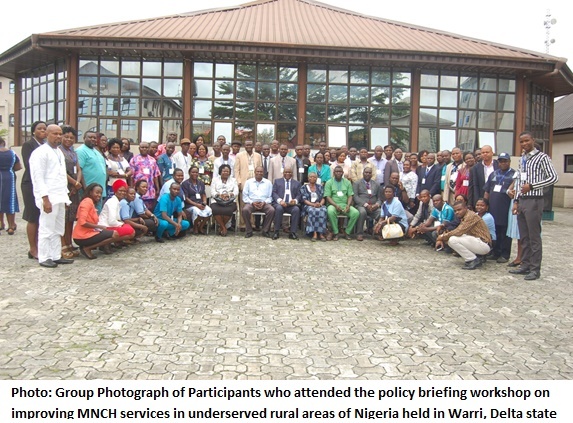 The MNCH policy workshop indeed provided opportunities for knowledge sharing and networking among key stakeholders, strengthened collaboration between governments at all levels and CPED project team as well as community leaders and groups.